PTC Mathcad. A perfect tool. Every engineer uses standard software for static analysis, e.g. 2D or 3D frameworks, programs for various standard calculations or special tools for very specified tasks. But what happens if there exists no fitting software tool? In such cases normally a manually calculation must me made with calculator, Word or Excel. In many cases this is a long, error-prone and complex process. With Mathcad you can create in a very easy way your own calculation documents including text, graphics and formula. Similar to classic text processing, but all formula are mathematically correct and the formula contents are variables, not only text elements. After completion of the calculation document or worksheet, you only have to assign values to the variables. Immediately after setting the variables the complete worksheet will be calculated automatically with the current values and the calculation is finished … completely without manual calculation and also without programming. It hardly can be simpler! Creating your own worksheets is easy and fast. In contrast to a classic text processing, there is no formula editor needed. Just type in the formula like it is on a paper. Mathcad takes care of the correct form of presentation automatically. Doesn’t matter if the formula include roots, high potencies, trigonometrical functions, matrices, integral calculus or greek names for variables. Mathcad checks every value for plausibility and points out the errors. For example for not defined variables. A special benefit is the management of units. Wherever you are, you can change the units of the worksheet. Just write N instead of kN…. All numbers will be adapted to the new units. The well known sentence "A picture tells more than thousand words" is correct here, too. We selected a few examples of calculations sheets for you, which are made by PTC Mathcad. 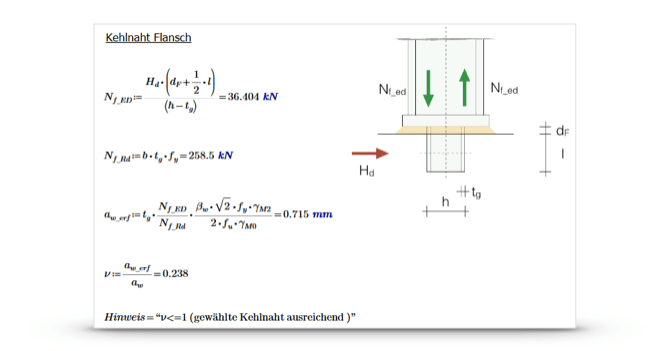 Calculations are the heart of your engineering information. You and your team must be able to find, reuse, and share this important intellectual property. Try PTC Mathcad now 30 days for free. Similar to classic text processing, Mathcad offers a lot of possibilities to design the worksheets in an attractive way. There are many fonts, colors and sizes. Also you can insert or create graphics. 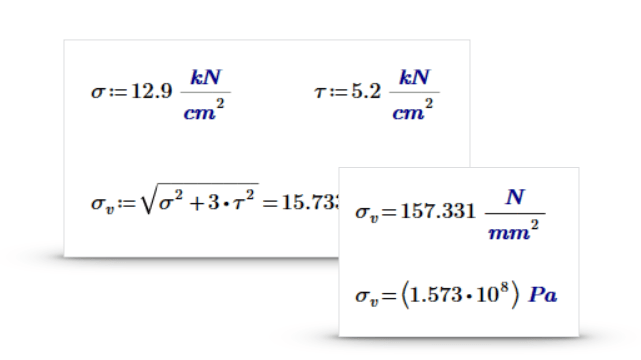 The formulas are in a correct mathematical format automatically. Usually, Mathcad worksheets can be created with no knowledge about programming. In some cases you have to proceed with formula A or formula B depending on a result or a specified value. Basically this is the most popular programming function. The if or else loop. In Mathcad, these crossing points can be created without programming knowledge. A special benefit is, that the loops can be placed invisible, so the result will just appear on the worksheet. Mathcad offers a lot of there programming elements which can be inserted to the worksheets without any programming knowledge. If you want more, you can create specified functions in C or Fortran for using them in Mathcad.